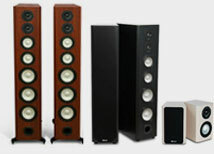 Judging by the number of threads on the Axiom message boards about setting subwoofer loudness levels relative to the other speakers in your stereo or home theater surround system, there seems to be uncertainty about how to do it and what constitutes the “proper” or correct level, if there is such a thing. (I tend to think not, as personal preference for the amount of deep bass output varies considerably from one person to the next.) However, it’s still important to get the acoustic output levels of your subwoofer and the other satellite speakers roughly the same, then, using that as a base, do the fine-tuning based on the material you’re watching or listening to. Since it had been some time since I tweaked my own subwoofer levels, I decided to explore the differences in settings using different test signals and sources. I used the Avia Guide to Home Theater DVD, Digital Video Essentials DVD, the Sound&Vision Home Theater Tune-Up DVD (a simplified version of the Ovation software used on the Avia disc), Chesky Records’ Ultimate DVD Surround Sampler & 5.1 Set-Up Disc, and the Dolby Digital test tones available from my H/K AV receiver. 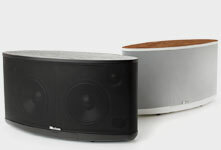 Axiom's new EP400 DSP Subwoofer, the smallest DSP subwoofer in our lineup. All these sources use different combinations of either warble tones or pink noise, sometimes full-band or band-limited, which sequentially rotate through each of the speakers in your system and the subwoofer. A RadioShack Sound Level Meter set to the “C” weighting scale and the “Slow” function, is essential. As you hold the meter in front of you at head level pointed upwards, you can then individually adjust the output of the subwoofer and balance it to each speaker in your 5.1-channel surround system. Or at least that’s the theory. On the rear panel of the subwoofer, set the volume control to the mid-point or a bit less, and turn the subwoofer’s own crossover control to Bypass (if it has a bypass setting) or to its maximum rotation. 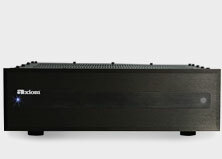 Note: If a user wants to experiment and set the subwoofer's crossover at the same frequency as the receiver's crossover, better integration of the subwoofer may be achieved. Experiments at Axiom have shown that with the EP400/500/600 subs, it's advantageous to do so because of the brick-wall algorithms in the DSP circuits. Now pick a volume setting on your AV receiver that’s typical of the range you usually listen at. Most people find that 70 or 75 dB on your SPL meter at your listening seat is a comfortable playback level. While 85 dB SPL is often used for THX movie theaters, that level is simply too loud for most listeners with test signals in the confines of an average-sized home theater or living room. I think much of the disagreement over setting subwoofer levels is based on a misunderstanding of how we hear bass frequencies. Our ears are quite insensitive to low bass compared to midrange frequencies, so depending on the level you initially set your AV receiver at and use to run the test tones, you may find that you are setting the subwoofer levels either too high or too low. I used 70 dB SPL at my listening seat and I found that I was setting the sub levels to +2 dB above 0 dB. If I lowered the sub level to 0 dB, there wasn’t enough deep bass when I played music or soundtracks. But if I used 80 dB SPL to set the subwoofer/speaker balances, I got more accurate settings, because when I listen to music, the levels often average about 75 dB to 80 dB SPL, peaking at 85 dB SPL at my listening area (subjectively most people call 85 dB “Loud”). 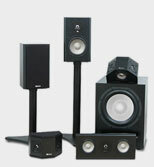 What surprised me were the variations and inconsistencies in subwoofer levels depending on which test DVD I used. The most accurate—for my particular room and listening tastes—turned out to be the Avia Guide to Home Theater. In particular, the bands of high-frequency and low-frequency noise (found in the “Advanced” chapter, under “Subwoofer Setup”), which alternated between each satellite speaker and the subwoofer, respectively, allowed me to set very precise and pleasing balances. The other test DVDs, while useful, just didn’t seem to be as accurate for my room and setup. Chesky Records’ Ultimate DVD Surround Sampler & 5.1 Set-Up Disc had lots of interesting subwoofer test signals, and because it had DVD-Audio tracks, it was useful for calibrating speaker levels for DVD-Audio disc playback.